How thick is gold leaf? Weird Winter Weather occurred this past month February 3rd. It was colder in Dallas-Fort Worth, Texas than it was in Anchorage, Alaska. El Paso, Texas had a high/low of 18/2 degrees and Fairbanks, Alaska was 16/9 degrees. Ice falling off Texas stadium prior to the Super Bowl injured a number of workers while air plane traffic was again cancelled because of snowstorms. Cyclone Yasi, a category 5 hurricane, struck Queensland Australia on February 2, 2011. The hurricane was 310 miles wide and struck the mainland with 186 mph winds. The storm sturge was 20 feet when it came ashore. It was one of the most powerful storms ever recorded to strike Australia. People were prepared for the hurricane and not one person was killed by the storm. It is estimated that there are move than 10 million pieces of debris in orbit around the Earth. The junk is a danger to the Space Station and other satellites. The debris includes fuel tanks, lost tools and collision fragments. A Japanese company is planning on cleaning up the junk with a thin net that would stretch a mile in space collecting space junk. The net would gather the material which would disintegrate in the upper atmosphere. The company plans to have it ready to put in space within two years. A Japanese volcano that was the location for the 1967 James Bond movie "You Only Live Twice" began erupting last month. The Shinmoe crater was used as the location for the movie that had been dormant since 1771. Ash spewed into the air over 10,000 feet and volcanic rocks were thrown over 5 miles during some of the blasts. A lava dome is building in the summit crater and volcanologists are monitoring the volcano closely. Thousands of migrating sharks were migrating northward this past month. A helicopter pilot took pictures of the migration that occurs each year. The blacktips and spinners will bite people but are not considered particularly dangerous. The term 'The Big Apple' was coined by touring jazz musician of the 1930s. They used the slang expression 'apple' for any town or city. Whenthey played in New York city they would say they were playing in 'The Big Apple' because they were playing big time in that city. Tornadoes usually spin counter clockwise in the Northern Hemisphere and clockwise in the Southern Hemisphere. Food eaten by a giant squid passes through its brains on the way to its stomach. Ninety percent of the world's ice covers Antarctica. This ice also represents seventy percent of all the fresh water in the world. Want to ride your bicycle to the Moon? It would take you three years of nonstop peddling to make it there. Owls eyeballs cannot move in their heads. Instead owls are able to turn their heads 270 degrees to see in almost all directions when looking for prey. Kangaroos hop forward but not backward. In the Sahara Desert there is a town named Tidikelt, Algeria. The town did not receive a drop of rain for ten years. This experiment challenges kids to see how many drops of water they can put on the top of a penny without the water overflowing. The record so far is 165 drops by some 8th grade students. Cut a paper towel into 2-inch squares. Place one of the pieces of paper towel on a clean dry surface. Place a penny on the paper towel. One person fills a small bowl with water and fills the eye dropper with water. The other person counts the number of drops on the penny before it overflows. 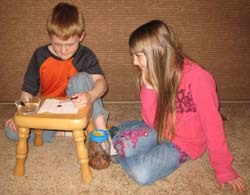 Repeat the activity with the person counting putting water drops on a dry penny. Try this experiment several times to see if you can increase the number of drops on the penny before it overflows. Water molecules are attracted to each other. This attraction called surface tension is the reason the water created a small mound on top of the penny. Gold leaf is gold that has been hammered into very thin layers. It takes about 300,000 sheets of gold leaf to make a stack one inch high. Gold leaf is also called gold foil and is used to cover statues, tops of buildings and hot-embossed printing on leather.